I wanted no part of this one. 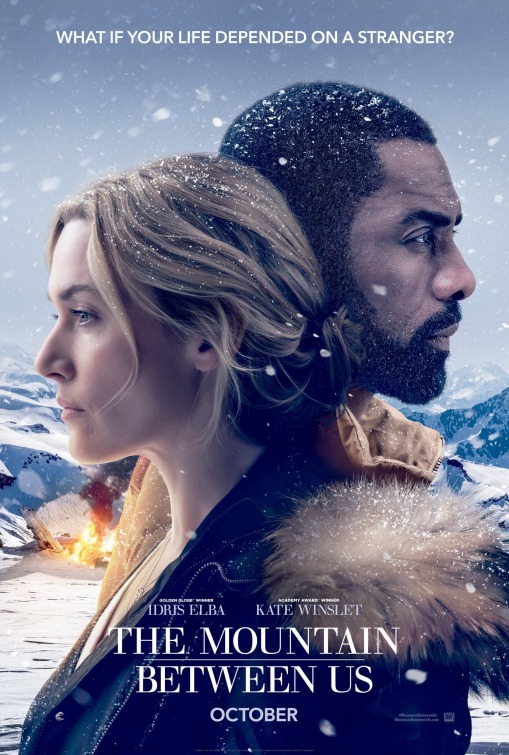 I did not like any of the trailers for The Mountain Between Us and the story just did not appeal to me. Nothing against Idris Elba and Kate Winslet, whom I enjoy, but I just did not want to see it. Then, when the reviews came out and they were basically panning the film, it reaffirmed my choice. However, I have gone to other movies that I did not want to see, so my lack of seeing this movie also was about scheduling. There were times when it was showing that I just was unavailable for or going to something else. It felt like the perfect storm. However, I found a gap in my schedule and it happened to be playing so I decided to go ahead and see the film, with full knowledge that my expectations were very low. And. much like other times when you go with expectations very low, the movie doesn’t seem to be as bad as you expected. Again, let me stress this, The Mountain Between Us is not a good movie, by any stretch. I just did not hate it as much as I anticipated. Kate Winslet played Alex Martin, who is desperately trying to get home for her wedding, but her flight is cancelled because of incoming bad weather. Idris Elba’s Dr. Ben Bass was in the same boat, trying to get to a patient. The twosome got together and decided to try to head around the airport by renting a two seat plane, piloted by Beau Bridges. I bet you see where this is heading. Bridges has some kind of stroke (or something) while flying and the plane crashes in the mountains, leaving Ben and Alex (and Bridge’s dog, named Dog) to try to survive the snowy mountaintop and the dangers of Mother Nature. If this would have just settled on being a survival movie, then it might have been passable, although, honestly, some of the worst parts of this movie dealt with the survival aspects. We’ll come back to that. The problem was this movie decided to turn itself into a love story as well between Elba and Winslet, and it devolved into so much melodrama that you can hardly stand it. Not only that, but Elba and Winslet did not have much, if any, chemistry on screen. I mean, both actors did what they could, but the script just did not give them anything. The performances by the two lead actors are reasonable, but these characters just were not worthy of the acting chops these two stellar actors possess. Now, back to the survival parts. I did not believe that they were ever in real jeopardy, nor did I believe that either character felt as if they were in any danger. Even though they talked about dying and the dangers around them, I never bought the feeling of stakes between the characters. We see only the minimal amount of effects of the surroundings on Ben and Alex. At one point, Alex falls through the ice into the water, and she is in there for several seconds until Ben can pull her free. He rushed her off to the cabin that he had just conveniently found to warm her up and give her a makeshift IV. No consequences for Alex for spending that time in the water. Neither character lost any toes or fingers, despite the hours they spent walking through knee deep snow. They also always seemed to be finding supplies or shelter or whatever they needed just in the nick of time. I was sure that they would be eating that dog before too long, but they never got to that point in desperation. The passage of time was also out of whack here. There is no way to gauge how long they were out there until Alex specifically says it. Then, the ending, without spoiling it, it barf-tacular. The film is pretty predictable so just think about how a melodramatic movie where the two heroes survive the outdoors might end up and you would probably be able to guess how this one ended up. Positives. Well, Idris Elba and Kate Winslet are very likable actors and you want to root for them. They give good performances for what they were given. The film has beautiful shots of the snow covered mountains and the outdoors. Plus, the film was not as terrible as I thought it was going to be.